Induction cooking uses induction heating to cause a cooking vessel to become heated, as opposed to using heat transfer from electrical coils or a gas flame as with a traditional cooking stove. For nearly all models of induction cooktop, a cooking vessel must be made of a ferromagnetic metal such as cast iron or stainless steel. Copper, glass and aluminum vessels can be placed on an interface disk which enables these materials to be used. 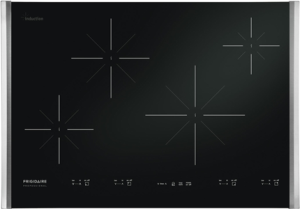 An induction cooker is faster and more energy-efficient than a traditional electric cooking surface. It allows instant control of cooking energy similar to gas burners. Other cooking methods use flames or red-hot heating elements; induction heating heats only the pot. Because the surface of the cook top is heated only by contact with the vessel, the possibility of burn injury is significantly less than with other methods. The induction effect does not directly heat the air around the vessel, resulting in further energy efficiencies. Cooling air is blown through the electronics but emerges only a little warmer than ambient temperature. The magnetic properties of a steel vessel concentrate the induced current in a thin layer near its surface, which makes the heating effect stronger. In non-magnetic materials like aluminum, the magnetic field penetrates too far, and the induced current encounters little resistance in the metal.